will need to register here to receive credentials. Sunday April 10, 2016 at Harper College (Building M) in Palatine Illinois. Doors open at 8:00 am. Tournament begins for 9 years & under at 9:00 am. Tickets can be purchased at the door or at any CMA location. **Important Change** Board Breaking will no longer have a flat fee as it was not fair to competitors. We will now charge $3 per board. If you need 3 boards, the charge is $9, 4 Boards = $12, 5 Boards = $15. 1. When registering your child for sparring we have 2 categories. Level I and Level II. If you are not sure which level, please speak with your Master or Instructor.  Level II - is for black belts. HEAD SHOTS FOR AGES 8 & UP. 2. Upload a recent head shot the competitor. The photo will be on the credentials that will be picked up the day of the tournament. 3. Weigh in is mandatory if you are sparring. Weigh in is between 8am-9am for ages 4-9 and 11:30am-1:00pm. If you are not sparring you will not weigh in. Simply pick up your credentials. Any competitors ages 9 & under who have a shoe size of 3 & under can borrow Daedo foot covers ring side. 5. You cannot sit or stand in the isles or stairway. We understand this can cause a problem videotaping your competitor. To balance safety, being courteous to all people watching and parents & friends needs we will now allow 1 person per competitor in the ring to video the match. You will have a chair next to the coach. No more than 1 person will be allowed. You must remain silent. Your are not to interfere with the match in any way. Do not speak to the referee, judges, competitor or coach. You are there to video the match, not help. If you decide to help, the referee will stop the match and you will be asked to leave. Do expect this privilege at any other tournament as it is unprecedented. If it goes well we will make this a standard practice. If people can not follow these rules, it will not happen again. 6. The day is organized by age, not event. This is so you may compete in multiple events and not be stuck at the tournament all day. 7. On this site, and the back of the credential you will find the ring layout. The competitor will be assigned a ring for all 3 events by their Tae Guk form. If you are not sure which Tae Guk form you are on, please ask your Master or Instructor. We do not use belt colors, as those are individual to each school in their order. Ring 1 is for Tae Guk 1 and 1st dan Black Belts doing Koryo. Ring 2 is Tae Guk 2 and 2nd Dan doing Kumgong . Ring 3 is Tae Guk 3 and 3rd Dan doing Tae Beck. Ring 4 is Tae Guk 4 ect. The competitor will have this same ring for forms, board breaking and sparring. If there is a ring that finishes quickly, a referee will move competitors from a crowded ring to save time. But they will always start off in their assigned ring. 8. Spectators will be charged a fee to enter. Children 4 & under are free. Adult (14 & over) $10. Children (5 yrs to 13 yrs) $5. Please bring cash. We do not except checks or credit cards. 9. Please keep all non-competing children close to you for their safety. Do not allow them to run around unaccompanied. Do not allow them under the bleachers. If children are found unaccompanied and in a dangerous situation, like under the bleachers a Harper employee will ask you to leave. 10. Do not sit or stand or in any way block the stairs or isles. This is a fire & safety issue. Harper employees will be monitoring and if this becomes an issue they will stop the tournament. 11. This is a family event. Please keep all conversations PG and with in the lines of good sportsmanship. Swearing, yelling kill him or destroy them is not in line with the Martial Arts Spirit. 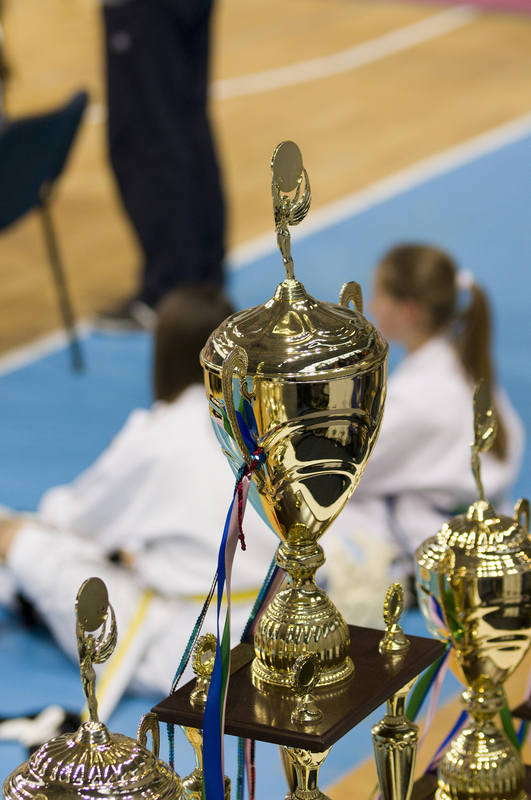 We want to encourage competition with our athletes, but also teach sportsmanship, respect and courtesy that Martial Artist are known for through our example. 12. Don not interfere with referees, judges or coaches. Doing so disrupts the process and could lead to an injury. If you have a issue that needs to be addressed, flag down any volunteer and we will assist you with haste. 13. No one except for competitors, their 1 person to video and coach are allowed on the mat or with in the roped area. This rule applies to everyone including Masters, school owners, instructors, parents, VIP’s and Master’s wives. This will be strictly enforced. 14. Have fun! Find your ring, settle and enjoy watching your competitor. Listen for announcements for any changes. If at anytime you need guidance, stop a volunteer and we will be happy to help. 15. Please respect our Judges, referees and volunteers. They all spend hours in training months in advance to get ready for this event. They are all all non paid volunteers and do this because they love the sport, With out them, we could not have a tournament. We are all human and have room for improvement. If you witness such a moment, ask for the tournament director and he will address this. We will also make sure it is address in future training. But please do not yell at anyone across the rope stopping the ring and upsetting our competitors with a confrontation. If you have any questions, please feel free to email us at cmaa.president@gmail.com or call us at 847-873-7692. All Tournament details including pricing, events, breaking patterns and form & sparring divisions can be found in the 2016 Packet.